SASKATOON , April 15, 2019 /CNW/ - George H. Read , P. Geo., Senior Vice President Exploration and Development of Star Diamond Corporation ("Star Diamond" or the "Corporation") is pleased to announce that Rio Tinto Exploration Canada Inc. ("RTEC") have completed an HQ core drilling and sonic program, consisting of 3 core drill holes at Star and 23 holes at Orion South (Table 1), and some 2,326.5 metres of sonic overburden drilling from 3 holes at Star and 21 holes at Orion South (Table 2). In total 3,976.52 metres of kimberlite were intersected from 7,056.00 metres of core drilling. This core drilling is required to accurately document the internal stratigraphy of the Star and Orion South Kimberlites in preparation for RTEC's bulk sampling with the Trench Cutter Sampling Rig. The core drilling program was conducted by George Downing Estate Drilling Ltd. of Grenville, Quebec . RTEC geologists are responsible for the supervision of the drilling program and subsequent core logging. 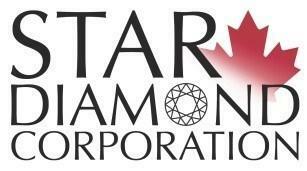 Star Diamond geologists also conduct independent logging of the core. In conjunction with this diamond drill program, geotechnical investigations of the overburden are currently being conducted, at the same locations as the core drilling, by Boart Longyear Inc., utilizing a Sonic drill rig. Detailed geotechnical logging of the core collected by the Sonic rig is being completed by Clifton Associates Ltd.
Senior Vice President Exploration and Development, George Read , states: "This core and geotechnical drilling program is an important precursor to RTEC's bulk sampling with the Trench Cutter Sampling Rig scheduled to commence once the warmer weather arrives. The selected locations of these core holes on the Star and Orion South Kimberlites will act as pilot holes for the upcoming program. Core hole FALCOSG008 interescted one of the feeder vents of the Orion South Kimberlite and drilled 449.48 metres of kimberlite before terminating at a total depth of 562.37 metres below surface in dolomite country rock. This deep intersection of kimberlite is consistent with the Orion South geological model prepared by Star Diamond geologists."